Industrial junction boxes are ideal for connection of cables in industrial equipments such as machine tools & dedicated machines, switching, power distribution, instrumentation equipment, as well as in harsh service environment. 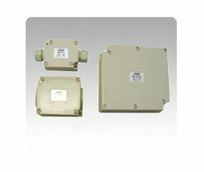 Our UL rated and CE certified junction boxes have outstanding environmental performances. Browse here for variety of industrial junction boxes with or without terminals and also 1-hole to 5-hole pushbutton boxes.